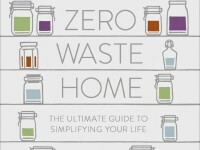 Last week’s post introduced Bea Johnson, a zero waste pioneer. She and her family have the remarkable goal of producing no more waste in one year than can fit in a large canning jar. She follows the 5Rs to help achieve this goal. Reduce—She distills reducing into three steps: evaluate past consumption; reduce future consumption; decrease your exposure to media and time spent leisure shopping, since these can lead to more consumption. Reuse—This includes selling or donating usable items you no longer need, as well as shopping secondhand first, before investing in newly manufactured goods. She also discusses “collaborative consumption,” which is basically sharing. This applies to things which you do not use all the time, such as tools, lawn equipment, recreational vehicles, cars, and even homes and office space. Recycle—This is a category she maintains for “what we cannot refuse, reduce, or reuse.” She advises knowing and understanding what your community can and cannot recycle. She couples this with the recommendation to select products with high post-consumer recycled content and choose those that are accepted in your local recycling programs. So, how about you? Ready to try a couple of new Rs? Or are you already following all five?